“Their Gov’t Wants to Curb Spread of Christianity,” The Blaze website blared. 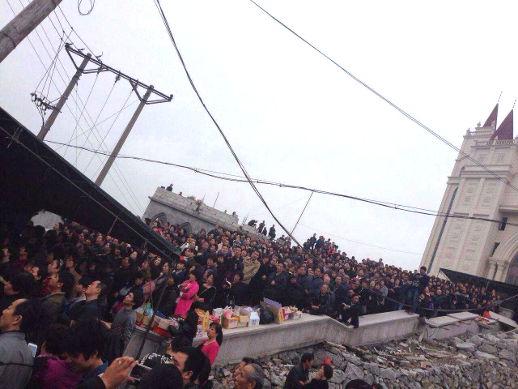 “Chinese Christians form human shield to save 4,000-seater church,” The Catholic Tablet said. “Chinese Church Faces Forced Demolition,” Christian News Network announced. “Faithful Rush to Protect Church With a Cross Deemed Too Tall,” wrote a New York Times blogger. Upon closer examination, the reality may not be as black-and-white as the headlines. “Nothing is this straightforward in China,” said Brent Fulton, president of China Source, a Hong Kong-based nonprofit that collaborates with hundreds of China-oriented churches and organizations through conferences, publications and consulting. Government authorities plainly were unhappy with the size of the church, but Fulton and others told World Watch Monitor it’s also plain that the congregation erected a building far larger than they had permission to build. Last week, both sides appeared to have compromised, and saved face. And that, the China sources said, may have been the desired outcome all along. One of the few certainties about the Sanjiang standoff is that it is an example of how difficult it can be to determine exactly what’s happening to the Christian Church in China. Affiliation with the Three-Self Patriotic Movement. Most news accounts reported the church is part of China’s officially sanctioned Protestant umbrella. At least two accounts, however, reported the church does not belong to the movement. The distinction is important because Three-Self churches enjoy standing to seek building permits and other government services. However, many non-official ‘underground’ or ‘house’ churches prefer independence, even at the risk of prosecution. Notice served to church. 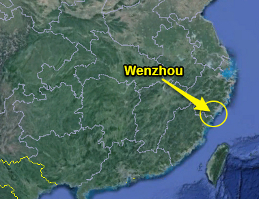 News accounts were unanimous that Wenzhou authorities served notice on April 3 that the church would be demolished in 15 days. It was less clear, however, why. Some news accounts said the building had been deemed unsafe; others said it violated unspecified building codes. Christian sources were quoted as saying Sanjiang was caught up in a wider government campaign to scale back churches in the region that had grown larger than their permits allowed. Some of the reporting said the party wanted the cross removed or covered. Some of it quoted church supporters as saying the complaint about the cross was a pretext for Wenzhou officials to bulldoze the entire church. Amid that swirl of speculation, one undisputed fact stood out: pictures and videos of hundreds of church members standing guard in and around the church, and of government demolition equipment stationed nearby. Behind the dramatic scenes, however, there were signs that both sides were seeking a way out of the impasse. “A local government official, who was not authorized to speak by name to the media, said authorities were trying to resolve the impasse peacefully and had never threatened to demolish the structures by force,” reported the Washington Post’s Xu Yangjingjing. The UK-based Telegraph noted the “days of intense negotiations between Sanjiang church leaders and officials” during the standoff. Last week, the two sides reached a deal: the church would remove two levels of a newly built, seven-storey annex. The main church building and its prominent cross would remain. As it turned out, the government removed four floors, not two, angering church members. “Both sides gave way on something. It is very common that Chinese officials do not want to be seen incapable by their seniors and they try to avoid making trouble,” said a China coordinator for Open Doors International, a global charity that provides aid to Christians who are pressured because of their faith. The coordinator’s name is being withheld to prevent government retaliation. The coordinator said Sanjiang Church had overplayed its hand. Granted permission to build a worship space on 20,000 square feet – about half an acre – the congregation instead built a church and an annex on 100,000 square feet, or more than 2 acres. Even then, the coordinator said, authorities turned a blind eye, calling the massive Gothic structure a “model project” – until the provincial governor toured the city in late 2013 and complained about the cross. That was in November. Church members began to take up watch at the church, in small numbers at first. Then the final notice was served April 3, the crowds mushroomed, and the news reporters arrived to find the made-for-TV scene of defiant Christians staring down government demolition crews. But the actual story was more complex. Fulton, the president of China Source, said Zhejiang Province, where Wenzhou is located, had begun a campaign last year to clear out old and illegally built structures. Several churches across the province have been ordered to scale back and remove prominent crosses. Christians in the region have reported that some churches in the region have been flattened. Pictures and accusations, not yet confirmed, are circulating on Chinese social media. In an email to World Watch Monitor, Fulton said the Sanjiang congregation had good reason to be anxious, though not necessarily because of any specifically anti-Christian policy. When they do get permission, he said, churches can feel compelled to build as assertively as possible while the construction window is open.